To make continuous, strong and conductive carbon nanotube fibers, it’s best to start with long nanotubes, according to scientists at Rice University. The Rice lab of chemist and chemical engineer Matteo Pasquali, which demonstrated its pioneering method to spin carbon nanotube into fibers in 2013, has advanced the art of making nanotube-based materials with two new papers in the American Chemical Society’s ACS Applied Materials and Interfaces. The first paper characterized 19 batches of nanotubes produced by as many manufacturers to determine which nanotube characteristics yield the most conductive and strongest fibers for use in large-scale aerospace, consumer electronics and textile applications. The researchers determined the nanotubes’ aspect ratio — length versus width — is a critical factor, as is the overall purity of the batch. They found the tubes’ diameters, number of walls and crystalline quality are not as important to the product properties. Pasquali said that while the aspect ratio of nanotubes was known to have an influence on fiber properties, this is the first systematic work to establish the relationship across a broad range of nanotube samples. Researchers found that longer nanotubes could be processed as well as shorter ones, and that mechanical strength and electrical conductivity increased in lockstep. The best fibers had an average tensile strength of 2.4 gigapascals (GPa) and electrical conductivity of 8.5 megasiemens per meter, about 15 percent of the conductivity of copper. Increasing nanotube length during synthesis will provide a path toward further property improvements, Pasquali said. The second paper focused on purifying fibers produced by the floating catalyst method for use in films and aerogels. 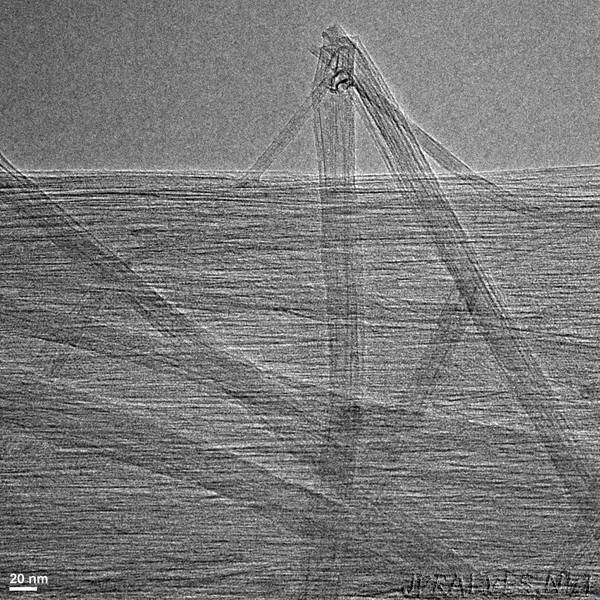 This process is fast, efficient and cost-effective on a medium scale and can yield the direct spinning of high-quality nanotube fibers; however, it leaves behind impurities, including metallic catalyst particles and bits of leftover carbon, allows less control of fiber structure and limits opportunities to scale up, Pasquali said. “That’s where these two papers converge,” he said. “There are basically two ways to make nanotube fibers. In one, you make the nanotubes and then you spin them into fibers, which is what we’ve developed at Rice. In the other, developed at the University of Cambridge, you make nanotubes in a reactor and tune the reactor such that, at the end, you can pull the nanotubes out directly as fibers. The reactor process developed a decade ago by materials scientist Alan Windle at the University of Cambridge produces the requisite long nanotubes and fibers in one step, but the fibers must be purified, Pasquali said. Researchers at Rice and the National University of Singapore (NUS) have developed a simple oxidative method to clean the fibers and make them usable for a broader range of applications. The labs purified fiber samples in an oven, first burning out carbon impurities in air at 500 degrees Celsius (932 degrees Fahrenheit) and then immersing them in hydrochloric acid to dissolve iron catalyst impurities. Impurities in the resulting fibers were reduced to 5 percent of the material, which made them soluble in acids. The researchers then used the nanotube solution to make conductive, transparent thin films. Alumnus Dmitri Tsentalovich, currently an academic visitor at Rice, is lead author of the characterization paper. Co-authors are graduate students Robert Headrick and Colin Young, research scientist Francesca Mirri and alumni Junli Hao and Natnael Behabtu, all of Rice. Thang Tran of Rice and NUS and Headrick are co-lead authors of the catalyst paper. Co-authors are graduate student Amram Bengio and research specialist Vida Jamali, both of Rice, and research scientist Sandar Myo and graduate student Hamed Khoshnevis, both of NUS.